Google Now for Android has just unleashed a powerful new advertising feature: The predictive service will now alert you when you’re near a store that carries items you’ve searched for using Google in the past. "You’ve been looking for the perfect pair of hiking boots online, but haven’t gotten around to pulling the trigger. Starting today, if you’re out and about and near a store that carries those boots, you might see a Google Now card showing you the product and price to remind you that you wanted them," the company explained yesterday via Google Plus. "Now all you have to do is pop into the store and check if they’re in stock!" Google Now already serves you traffic alerts, news stories, stock prices and other information it thinks you’ll find relevant based on your past searches and GPS-determined location. Adding these shopping notifications seems like a natural, if slightly intrusive, fit for the service. Location based ads are hardly a privacy-friendly feature, but that's part of the tradeoff in using Google Now. This has been a big week for updates from Google. The company has also released Google Maps 3.0.0, a major new build for the popular navigation app that includes a new Lane Assist feature to make sure you’re ready to make your next turn. And if you don’t feel like leaving home at all, residents of NYC, LA and San Francisco can now take advantage of Google Shopping Express, the company’s free (limited time) same-day delivery service. 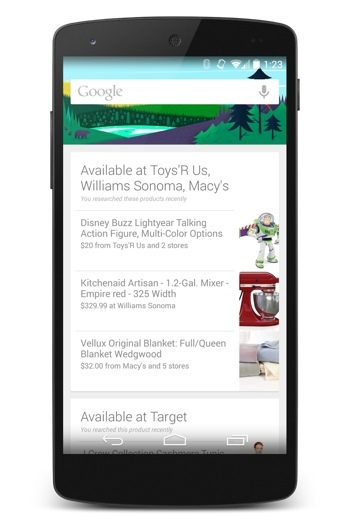 You can enable the new Google Now feature by updating the Google Search app on your mobile device. If you don’t already have it installed, you can get Google Search for Android at Google Play. This is exactly what I DON"T want from any device I carry. Computers should be servants, not masters. It should respond to my explicit requests. If it is not responding to my explicit requests then it is NOT acting in MY interest. The fact that people might think this is a good idea is just plain depressing. This is such a great article, very insightful and a huge step forward for marketers and omnichannel shoppers alike. Bring it on!